I’ve had more fun than one really should at work lately, trying out a shiny new set of Magic Belt books with various struggling and reluctant readers. These are good-looking and well-written decodable books for 8-14 year old struggling and reluctant readers. I showed them to an eight-year-old in clinic the other day, who easily and willingly read the first one, and was reaching for the second one when I said we didn’t have time to read it that session. Well. He was not happy, and we heard about it. Once he realised I meant what I said and I said what I meant, he started madly leafing through the books trying to work out how the story ends, and demanding that his mother quickly read him the last book. Not bad for a struggling reader who’s not terribly interested in books. Today at school, we had a lovely time talking about magic, wizards, danger, excitement, giant crabs, rock mosters, goblins, earthquakes, dung beetles and cauldrons. That was just while looking through the front covers of the Magic Belt books- click here to see them yourself. The slightly dark, cartoon-style illustrations are reminiscent of a graphic novel, and the page colours and layout add to the “mysterious olden-days” look and feel. I don’t think I’ve appreciated how much great illustrations can increase the appeal of a book, because I’m a wordy kind of person who can’t draw for nuts, and because I’ve been so cross for years about children being told to “look at the picture and guess” the text. I’ve been successfully using various decodable books with their generally fairly daggy illustrations for years, and not worrying about the pictures. 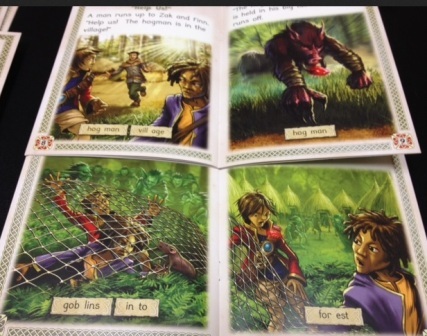 So showing kids a set of books that are both decodable but also beautifully laid out and illustrated has been a bit of a revelation – kids love them. The story which runs through the 12 books is about a boy called Zak, who sets off to get help for his sick grandfather, and meets a wizard who gives him a magic belt and a map with red crosses on it. The wizard tells him that he has to find the missing stones from the belt in order to save his grandfather. Then the wizard disappears. Zak and his friend Finn then have all sorts of adventures recovering the missing stones. 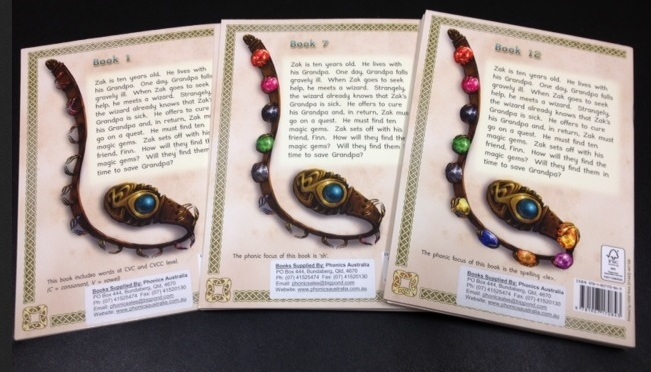 On the back of each book is a picture of the magic belt, and as you progress through the set, more and more of the missing stones are in place – here are the backs of books 1, 7 and 12. I won’t spoil the denouement for you except to say that it involves some double-crossing and a loyal animal saving the day, always a favourite in books of this type. The Magic Belt books are not for absolute beginners, they’re for exactly the kind of kids who end up on Speech Pathology caseloads because of their literacy difficulties. These kids know one sound for most letters and can do a little bit of blending, but beyond that, they’re pretty lost. When we came to a long word today, I said “that word has two mouthfuls, lets see what they are” and pointed to the chunked variant at the bottom of the page. Learners were then consistently able to blend each chunk individually and then put the two chunks together to get the whole word. I think we need to be doing lots of this type of chunking multisyllable to help learners manage syllable boundaries in words, which is why I include it in my Level 7 and Level 8 workbooks (I use dots rather than spaces for syllable breaks, but the principle is the same). The first Magic Belt books focus on Consonant-Vowel-Consonant (CVC) and CVCC words, like “sun”, “bed”, “help” and “hums”. Next they introduce the suffix -ed in words like “stopped” and “yelled”, and CCVCC words like “glint” and “crept”. 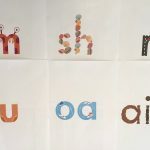 Then the focus shifts to introducing and practising consonant digraph spellings like “ch” as in “crunch”, “tch” as in “fetch”, “sh” as in “brush”, “th” as in “thanks”, “ck” as in “stuck”, “qu” as in “quit”, “wh” as in “when”, the suffix “ing” as in “sizzling” and finally “le” as in “cackle”. 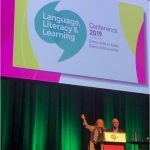 There are occasional vowel spellings beyond “short” vowels – “oo” as in “look”, “a” as in “last” and one or two other words in most books, but they mostly focus on giving learners a good, solid workout on “short” vowels and consonant spellings. For additional spelling patterns, try the Alba, Totem and Talisman books by the same publisher. I’ve been using the Alba ones today too, and love them, particularly because they have a girl hero, who gets shrunk to 10cm high by a baddie, and sets out to save the world’s apple trees in a series of amazing adventures. She is way cool, and the boys seemed to like her just as much as the girls and I do. 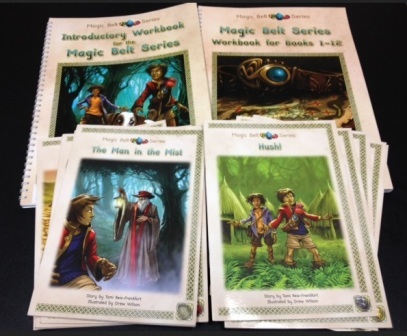 As well as 12 readers, two Magic Belt workbooks are available. One is a slim volume (50 pages) for learners who are preparing to read the readers, called the “Introductory workbook”. 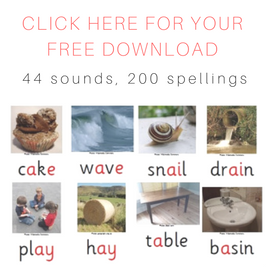 It contains activities which teach the following spellings: s, a t, i, m, n, o, p, b, c, g, h, d, e, f, v, k, l, r, u, j, w, z, x, y, ff, ss, ll, zz. 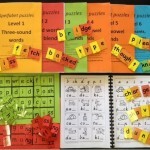 Most of the words in this book are simple Consonant-Vowel-Consonant ones, and there are wordbuilding, reading and spelling activities as well as some games and little stories. Nice. I have one student for whom this book is perfect, he’s not quite ready to read the readers, but this workbook should help get him there. The second workbook is much longer – 191 pages – and includes a similar range of activities focussing on the syllable and spelling patterns in the readers, plus comprehension activities about the readers, some slightly more open-ended writing about them, and some work on punctuation. This workbook is going to keep the integration aide working with the little chap for whom it was purchased happy and highly productive in all the lessons where he can’t currently tackle the regular work. Tomorrow I’m going to ask the school librarian whether she can buy some of these books, since the Little Learners Love Literacy books we got earlier this year for the Early Years children have been very well-used. If the library budget for this year won’t permit this, I suppose I’ll have to go grovelling to philanthropic trusts. This school has a big socioeconomic mix, and many families can’t afford to buy the supply of readers strugglers often need, especially slightly pricey readers like these (those nice illustrations don’t come cheap, I suppose). After school, I stopped by the local public library and showed them the Magic Belt and Alba books, and asked what they had for older, reluctant and struggling readers. The nice librarian on the desk’s eyes lit up. 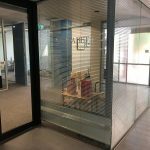 She said they had recently been discussing the Australian Bureau of Statistics data on adult literacy which show that far too many adults can’t read, and it had just been made her responsibility to provide resources for struggling readers. So she’s photocopied the Australian order form and we’ve exchanged cards, and I hope my students and others will soon be able to borrow these great little books from the local public library. I’m also planning a coffee with her to suggest a nice big list of other decodable books for all ages that IMHO should be in every public library. If you can do the same in your local public library, I’m sure future struggling readers and their parents in your area will appreciate this, and really benefit. 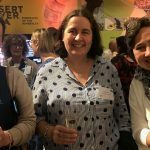 The Magic Belt books and lots of other lovely resources I’ll no doubt rave on about some other time are published by Phonic Books in the UK, in Australia they are supplied by DSF, SPELD SA and Phonics Australia – DSF seem to have the best prices. Suppliers elsewhere are listed here. They are not cheap at about $AUD10 per book, but books are a bit like shoes, if you’re going to use them over and over, you’ll get your money’s worth (she said. No, I am not channelling Imelda Marcos, I have a very modest number of shoes). The shiny new books I’ve been showing people actually belong to a little chap whose funding all had to be spent before he turned seven, and whose school I visited today, so I have had to hand them over. Sigh. I suspect I’ll soon be heading to the DSF website with my own credit card A) because I like these books myself and B) because libraries take a while to get new books, and in the meantime I’m not sure I’ll be able to withstand kid pester power. 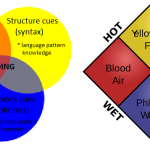 This entry was posted in books, phonics activities, reviews on July 25, 2013 by alison.